Earth 2: Society has been a tough sell for me so far with it's Convergence reboot, it's one year laters and flashbacks and characters being so different from when we left them in World's End...... which really shouldn't be a bad thing, but it's just hard getting into this book when I'm not positive what it's going to be or what it wants to do. Hopefully, that changes here because in the previous issue we saw Val-Zod, Flash and Batman team up to stop Overwatch-One from crashing into Neotropolis and after the deed was done, we were let in on the fact that Jimmy Olsen, or Doctor Impossible as he goes by now, was the one responsible for the act. Yeah, this could be something worth reading now that we know Jimmy Olsen is the big bad of the story and I hope beyond hope that I'm not wrong and that this book becomes as great as Earth 2 was when it first began.......Here's hoping! Let's check it out. Now I don't know if our trio of heroes found some kind of clue that let them in on the fact that Jimmy Olsen was the man behind the attack on Neotropolis or if they just went after Anarky and found that Jimmy and her were pals or whatever, but when we start this issue out our heroes are heading right towards Jimmy, Johnny Sorrow and Anarky in their pursuit of Truth, Justice and the Earth-2 way. It's a pretty cool fight right out of the gate with Val-Zod taking on Jimmy Olsen with his god powers, Batman taking on Anarky and Flash taking on Johnny Sorrow........ Too bad that Flash didn't know not to look in Johnny Sorrow's face though because after the first blow, Flash was out of the fight and having himself some PTSD from looking at the UGLY that is Johnny Sorrow's face....... I still have that whenever I look at Rocky Dennis...... or think of Rocky Dennis...... OH GOD NO!!! None of that matters though because Jay will be back in the fight in no time, what matters is the new fighter that has entered the fray and I'm a bit pissed off because here we have Hour Man, one of my favorite characters and now he's a bad guy. Yeah, maybe he'll have a redeeming factor at some point in the future, but right now he's keeping our heroes busy while Jimmy Olsen boom tubes away to deal with something else....... and like every other issue in this series, that means it's time for a flashback. 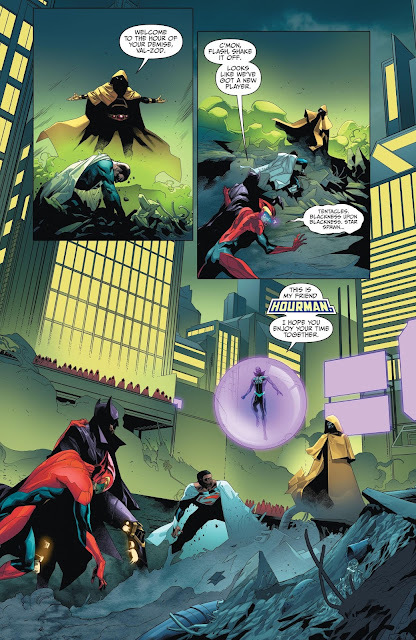 Okay, so Three Months Ago we had Jimmy Olsen, Huntress and Red Arrow working on a new Source Vault since their original one was stolen by Terry Sloan, but apparently the one they were working on blew up in Helena's face.......... what looked like it could have become a Two-Face like scenario and Red Arrow was quick to point fingers about how it was Jimmy's fault and really wanted to emphasize that Jimmy was just a boy...... So yeah, I'm blaming Red Arrow for Jimmy turning evil after that. A week later, we have another incident, where Rick Tyler broke into Waynecorp in order to steal back his father's Miraclo that Thomas Wayne stole from him in the first place and I guess in a week Jimmy had all his evil plans going because before Red Arrow and Huntress could detain Rick, Jimmy teleported him away and got him to start worshiping his Doctor Impossible persona. 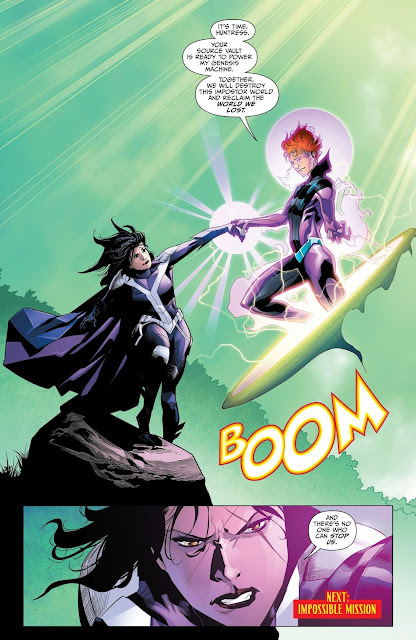 In the end, we move back to the present, where Power Girl and Huntress are checking out the Green Lantern quarantined zone, where Terry Sloan managed to terraform a bit of Earth-2 into a paradise and even though Kara keeps telling Helena to move on, it seems that Huntress isn't about it and that becomes completely clear after Kara leaves and Jimmy boom tubes in, takes Huntress by the hand and asks her if she's ready to bring Earth-2 back to life........ in which her response is "There's no one who can stop us". So yeah, Hour Man is a bad guy, Huntress is a bad guy, Jimmy Olsen is a bad guy...... this story is getting crazy........ Crazy interesting! That's it for this issue of Earth 2: Society and while I've complained over and over again about this title and how I'll never let my optimism get the better of me in thinking that this is a title worth saving...... I have to admit that this issue actually got me excited again and was half decent even with the annoying flashback story telling method. There was action, some motivation, twists and best of all, no continuity killing elements to the story. 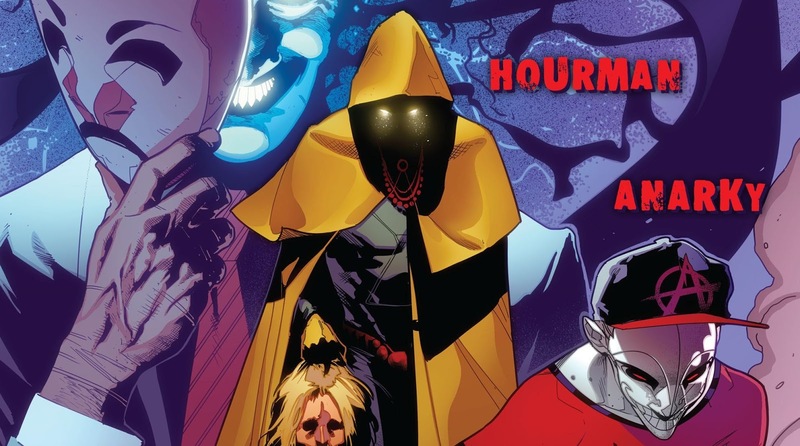 Even if I'm pissed that he was a baddie, I'm happy as hell to have Hour Man in this series and I think the reason that I got into this story as much as I did was because it's finally doing the one thing that I've wanted Earth-2 to do forever now and that's give me heroes vs. villains and finally the stage is set for that to go down. Yeah, it's not a perfect issue, but to me if feels like it could be the best issue of the series so far........ and for as hard as I've been on this series, that's something in my book. Besides for the story though, the art in this book goes back and forth between being really decent and too cartoony and for whatever reason, it feels like it always has to do with the Flash........ maybe that's just me, but if the art could dial back the over the top cartoony feel just a bit, it would be the bee's knees...... speaking of bee's knees, the colors are down right blinding in how spectacular they are and if you've been on the fence with Earth 2: Society or even cut it from your pull list already, maybe it deserves a second look because........ and mind you, this could just be the dummy in me jumping out, but it feels like this series might actually go somewhere fun. I was shocked at how much I enjoyed this issue from what it's given us so far. There I was pages through this book that I had completely given up on and it went and did the unthinkable (at least how I was thinking about it) and caught my attention. We've got the one thing that I've desperately wanted out this series and that's heroes fighting villains and it's not bad. 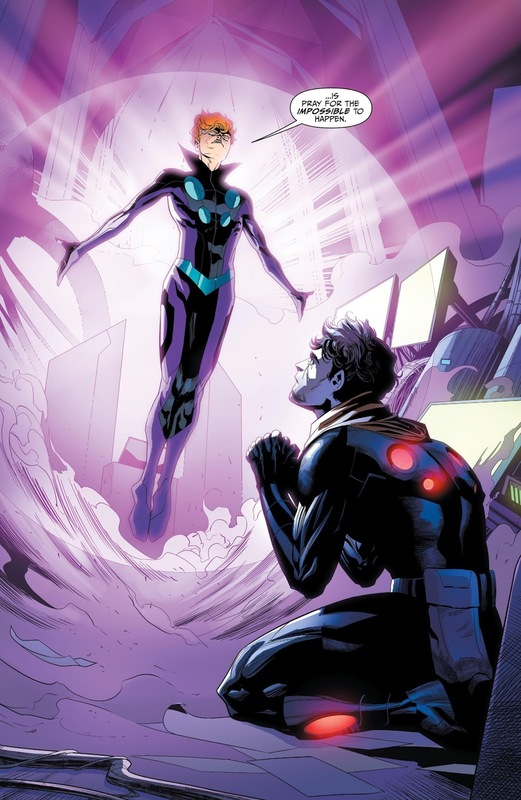 If the series continues along the same lines as it set here, then Earth 2: Society might be a book to take a second gander at because this issue was one of if not the best we've gotten so far. I agree, Red Arrow was being a jerk... " I learned it by watching you" (you know from the father son 80s drug commercial). So Earth-2 came back to life after Convergence as Green Latern terraformed it with life when 3 starships crashed into its surface. Then Terry Sloan terraforms a small area into a paradise before being killed and now Doctor Impossible wants to terraform planet AGAIN. Yes I'm confused and WTF is with the different timeline every 5 pages!! Current Earth-2 used to be the planet to Arak's people which turned into Telos during Convergence and was converted into current Earth-2 after Convergence. Arak was able to control the planet as we learned in Telos #2. Telos was then able to control or was the planet during Convergence. Alan Scott controlled the planet after Convergence but disappeared. Terry Sloan tried to terraform Earth-2 to control the planet I'm guessing. Now Doctor Impossible wants to terraform and control the planet. Something going on there! 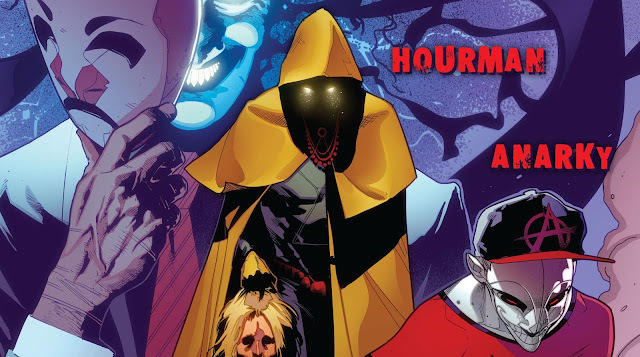 I didn't read this from the start, only jumping in when someone in my Anarky group gave me a heads up, but my impression of the flashback is that Helena Wayne is Anarky. I didn't even think about that! 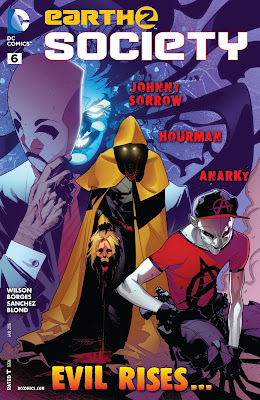 But I did look at Anarky on the cover and really can't tell if it's a girl or a young boy.